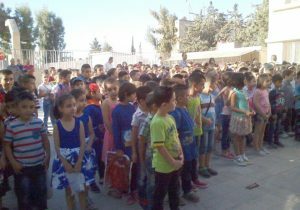 Provinces, SANA – About four million students in Syria headed on Sunday to their schools on the first day of the new school year 2016-2017. 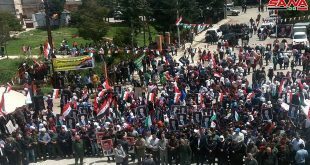 The students are distributed among 15,000 schools that have been making all preparations to receive them in all the Syrian provinces. In Sweida province, around 100,000 students headed to their schools. Head of Sweida Education Directorate Haitham Naeem said that 555 schools have been supplied with all that is needed for the basic education and secondary education stages in all areas in the province, adding that repairs and maintenance in 17 schools have been accomplished in cooperation with the United Nations Children’s Fund (UNICEF). He pointed out that the 47,000 school bags provided by the UNICEF will be distributed among students from the 1st grade to 4th grade, and there are efforts to include 5th and 6th grade students in the distribution process. 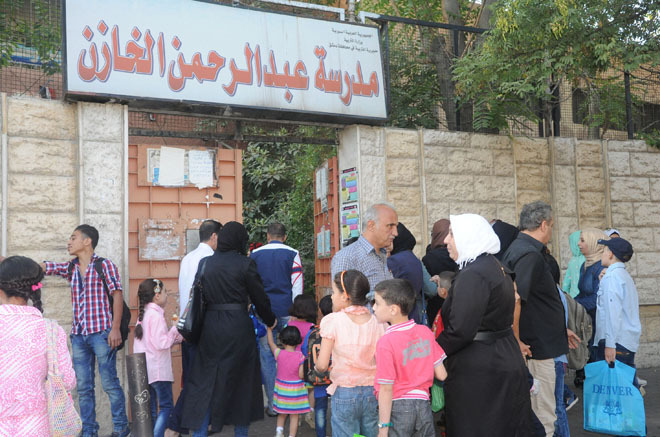 In turn, head of Hama Education Directorate Yahya Abd al-Ghani affirmed that 275 health workers have been distributed among the schools in the province to maintain a healthy and clean environment in them. 84,000 students and 3255 teachers headed to 181 schools in Quneitra province, where the Education Directorate finished maintenance in 57 schools in safe areas in the province with a cost of SYP 266 million in cooperation with international donor organizations. 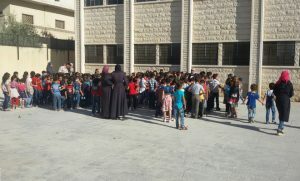 In Homs, about 350,000 students headed today to their schools, and the head of the Education Directorate Ahmad Ibrahim and UNICEF representative of Faz Shah paid a visit a number of schools in the city of Homs and distributed school bags to the students. Ibrahim said that the educational process is going excellently in the entire province’s schools. In the coastal province of Tartous, around 252,000 students headed to 1,310 schools distributed in all the province areas. Head of Education Directorate in Tartous Abdelkarim Harba said that the directorate, in preparation for the new school year, carried out maintenance work in 135 schools at a cost of SYP 74 million, adding that in 2015-2016 school year the province received 55,000 displaced students and dedicated five schools that are near their housing centers for them, in addition to all the province’s schools that are receiving displaced students, noting that enrolment for displaced students is still open. 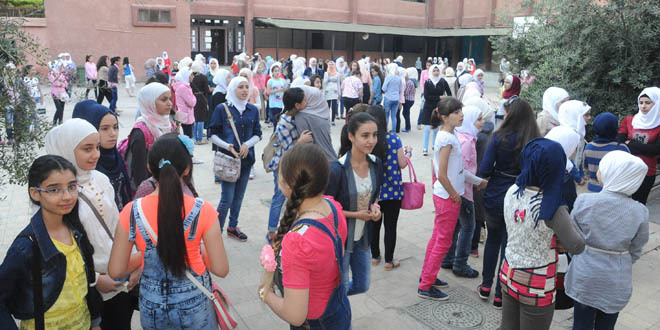 Meanwhile in Hasaka, the Education Directorate said that 200,000 students headed to their schools which consist of 200 secondary education schools, 200 schools for the second phase of the basic education stage and 2,000 schools for basic education students (from 1st grade to 6th grade). It’s worth mentioning that in the 2015-2016 school year, around 15,000 schools have received 4,134,047 students, while the number of the workers at the education sector was around 311,914 in all provinces. On a relevant note, Prime Minister Imad Khamis toured a number of schools in Damascus and inspected their readiness to receive students. After the tour, the Premier met the educational team at the Education Ministry which briefed him on the steps taken to ensure the success of the educational process and develop it. 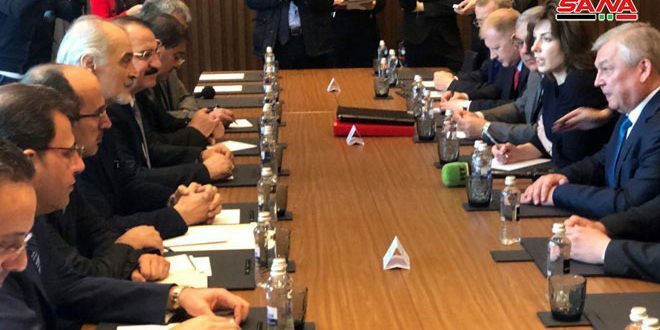 The tour and the meeting were also attended by the Ministers of Educaiton, Social Affairs and Labor, Information, and Culture, along with the Governor of Damascus and the head of the Teachers Syndicate. 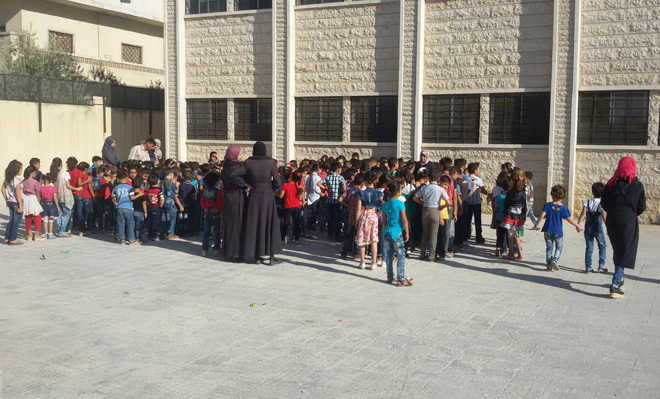 In a statement after the meeting, Education Minister Hazwan al-Waz said that launching the 2016-2017 school year sends a message to the world proving the Syrians’ determination to continue with their lives and pursue knowledge and education. Meanwhile, Social Affairs and Labor Minister Rima al-Qadiri and Information Minister Mohammad Ramez Tourjman said the meeting stressed the importance of integration among ministries and authorities to improve the education sector and strengthen it, in addition to discussing issues like kindergartens, students with special needs, and early childhood.